Loading Dock Supply always strives to bring to you the best possible solution for your current and future ramp needs. Achieving this goal has lead us to offer a variety of custom options born from the continued needs/requests of our customers. While our standard Yard Ramps are ideal for the majority of applications there are times where specific features are required for approval. With the support of onsite engineers and one of the most reliable manufacturing facilities in the country we ensure you are not only receiving the highest quality product, but also the reliability expected of ramps coming from Loading Dock Supply. When determining which type of ramp you need we suggest giving our sales staff a call at 1800-741-1258. We strive to help you determine what variables should be considered before quoting/purchasing; this way we ensure you are receiving the most accurate information for your bid. Adjustable legs are available for yard ramps both with and without the pneumatic undercarriage. While standard legs are not designed to support the weight of a forklift (that is the job of the 15" lip) they do allow the ramp to be used without a pneumatic undercarriage or forklift. 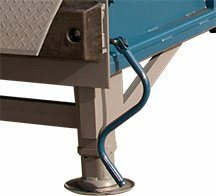 We also offer a heavy duty version of our yard ramp legs for instances where the ramp lip will not rest on the bed of a trailer or on a loading dock. Yard Ramps with adjustable caster legs are an ideal option for for their ease of use and minimal mechanical components. Durable polyurethane caster wheels provide a lower maintenance alternative to a hydraulic undercarriage. There are plenty of applications out there were a yard ramp is used both as an access point for forklifts and pallet jacks, but also as an entry for pedestrian traffic. In most states where handrails are required for pedestrian use our simple bolt on handrail attachments provide a simple solution with fast installation and removal. 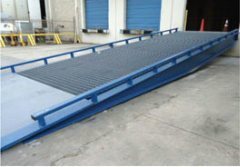 We are now offering high capacity yard ramps designed to hold up to rigorous use under heavy machinery and unique applications where 60,000+lb loads are to be loaded and unloaded. Flip plates are an interesting option allowing for full access to a container or trailer opening. 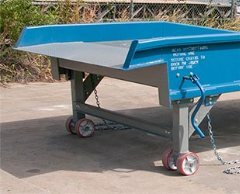 While our standard yard ramp lip is designed to rest whithin the trailer, making 16" of the opening width unusable due to the curbs, the flip plate option can utilize the full width of the trailer opening when coupled with the heavy duty leg option. Flip plates also offer an alternatively higher weight capacity than a face mounted edge of dock leveler; reaching up to a 40,000 lb capacity rather than the edge of dock levelers cap at 30,000 lbs. For permanent applications, where the door is closer than 15" from the curb edge, we offer a recessed lip curb option. With a recessed Lip curb your door will securely close onto the lip of the ramp without the need to move the ramp far enough back to clear the 8" curbs. Add and edge of dock leveler to the face of your yard ramp for applications where the full width of the opening is needed. EOD operates at 5" above and below the deck level.